Maybe it’s because there’s only a few more weeks left before Pantone announces its 2019 Color of the Year, but we’re still totally crushing on purple. It’s one of the best bridesmaid colors ever, because it has so much ‘shades of’ potential to share. And it looks good on just about anyone - light-skinned, dark-skinned, blonde or brunette - if you’re wearing some persuasion of purple, you’re doing it right 👍. In any case, Khloe Jaymes, the millennial-focused sister brand of Bari Jay, just launched a new spring collection and the purple inspo is pretty major. So, for anyone getting married in Spring ‘19, we’re already putting together power palettes for you and your girls… and guess what? You don’t even have to go out to try the dresses on, if that doesn't work for you. YUP. Khloe Jaymes, sounds like someone you’d like to know, right? We kind of envision the brand as a new girl who’s realllll cool - like, we-want-to-be-besties kind of cool. 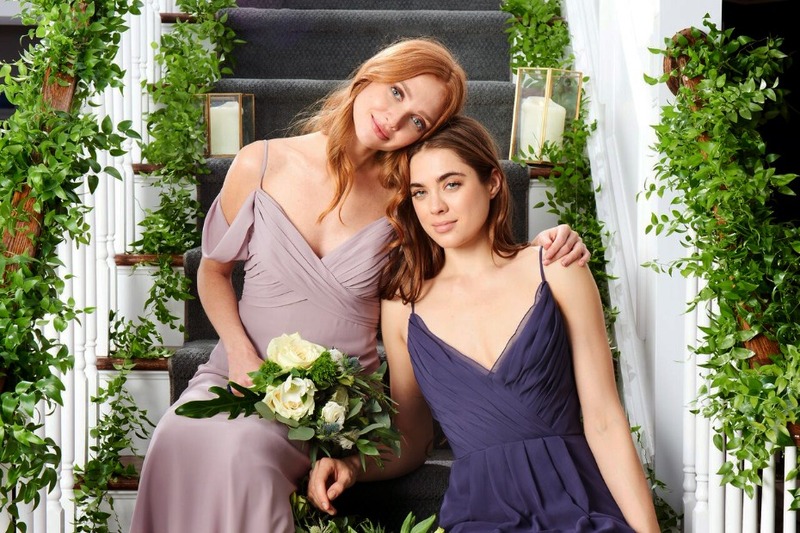 And that’s exactly what the Bari Jay sisters had in mind when they ideated this new millennial iteration of bridesmaid and special occasion dresses. Customers basically have THREE WAYS to order. 1) They can go into an authorized retailer and try on their dresses there, which is awesome especially if the bride wants to make a day of it with her group. The shop squad can help each bride and her besties either make the purchase there or handle it, thereafter, at home. Then the dress can be shipped either to a bridesmaid's door or to the retailer to be steamed without her having to deal with the hassle 2) They can order online at their own discretion and have dresses shipped directly to them. 3) They can have a bit of both - by ordering samples to try on at home at their own convenience (more on that below). Of course, getting to touch and feel everything in-store definitely has its perks! The bridal consultants at any Khloe Jaymes official retailer can be a HUGE help when trying on bridesmaids dresses and deciding on a final look (or looks). Not only can the process be overwhelming, it can also just be much harder when you don't have that third-party perspective. So, store staff can really help from both a styling standpoint and also the shopping standpoint itself. They can provide unique discount cards for you to use at home with your order (if you need any more time to think the purchase over). The flexibility is FABULOUS with this brand. Also, their offerings aren't just on-point, they’re also available in 20 shades and sizes 0-26W (stretch lining sewn into every dress, for full comfort and support, and no plus size fees), so every girl can rock a look and feel her best. We truly don’t kid around about this kind of stuff, because color palettes are our life. But we’ll put out a challenge to you to try and find a bridal party that doesn’t look absolutely stunning in purple. It can’t be done because 1) as we mentioned above, purple is magical🔮🔮🔮 - it vibes with any skin tone and is ultra versatile 2) the color is literally nuanced - so everyone in the squad can find something to suit themselves and the mix and match game is TIGHT. 3) it plays well with so many other colors, like pastels for Spring and richer, more saturated blushes and blues for summer and fall, since it’s sort of a classic neutral // goes with everything! Including greenery 🍃. Eucalyptus next to anything purple = luscious rustic romance. Khloe Jaymes’ new colorways include Plum and Victorian Amethyst, which pseudo straddle the Ultra Violet color. We love how the rich amethyst pairs with lighter, softer tones, but they look beautiful together, too! Thinking about putting your crew in the hue? We love how this looks. If you do, too, then shop now! We totally recommend the try before you buy, but if you’re super into the styles already, and just need some color context, then use promo code “SWATCHES99” @ checkout for 99-cent swatches + free delivery. We partnered with Khloe Jaymes to share some more on the brains behind the brand and what purple looks we're loving on. As always, thank you for supporting our sponsors!